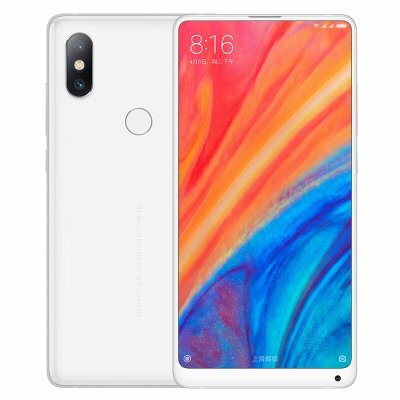 Successfully Added Xiaomi Mi Mix 2S Android Phone - Qualcomm Snapdragon 845, 128B ROM, Octa-Core, Bluetooth 5.0, Wireless Qi Charging (White) to your Shopping Cart. Meet the XiaomiMi Mix 2S - China’s latest Android phone that is sure to impress even the most demanding smartphone users. Once again, Xiaomi has managed to raise industry standards by introducing us to their latest smartphone. With its state of the art features and powerful hardware, there is nothing this Android phone can’t handle. The XiaomiMi Mix 2S comes packed with the Qualcomm snapdragon 845 processor. This Octa-Core CPU has been clocked at a stunning 2.8GHz and is capable of handling the latest and most demanding software with ease. Along with the phone’s 6GB RAM, you’ll be able to play games and watch movies throughout the day without ever dropping a frame. The XiaomiMi Mix 2S Android phone features Dual-IMEI numbers. This means that you can slide in two SIM cards and stay connected to both at the same time. It furthermore treats you to ultra-fast dual-band WiFi as well as 4G connectivity. With this latest Android phone at your side, you’ll always stay connected no matter where you go. To further increase your use experience, the phone supports Bluetooth 5.0 for ultra-smooth data transfer as well as NFC. Running on an Android 7.0 operating system, this stunning smartphone is guaranteed to offer a smooth user experience. It comes with a beautiful 5.99-Inch display that treats you to a breathtaking cinematic experience in 2K resolution. With its 3400mAh battery, the phone delivers a continuous usage time of 12 hours. This is enough to get through the longest of days without needing to worry about running out of juice. Whenever your battery is running low, you can easily charge it through USB or through wireless Qi charging. With its 128GB internal storage, there is plenty of space for you to keep your files, media, and pictures. The latter of which can be snapped with the phone’s professional-grade 12MP dual rear camera that comes equipped with a wide-angle and long focal lens. Not only does this beauty shoot breathtaking images, it also lets you record video in stunning 4K resolution.